This is a dummy text. You can add here custom description or custom sort description here. You can design it in your own way. This is just dummy text. 90 Day Money Back Guarantee. Bonrix Recharge System is a PC based system that enables recharge outlets using E-recharge (LAPU) SIMs for recharging, to extend their services through remote agents apart from recharging for Walk-in customers. The remote agents registered with the system can send recharge requests to Bonrix Recharge System through a simple SMS. Remote agents do not need E-recharge SIMs or GPRS handsets. 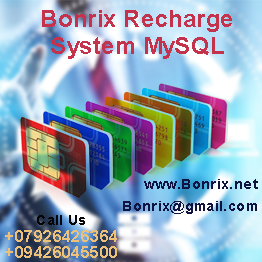 Recharge is carried out automatically by the system.To start a dedicated Mobile Recharge Business to promote network with One Sim Mobile Recharge, Bonrix Recharge system is best application software. We named it as Bonrix Recharge System, It offers complete control over your own mobile recharge business. You can control your operators, Long Code, Bulk SMS and Mobile Recharge API as per your needs. Our Aim is to understand Client idea and plan out a strategy that best addresses As per the Client Requirment and giving best suitable solutions and great satisfaction as per client expectation. © 2016 Bonrix Software Systems. All Rights Reserved.